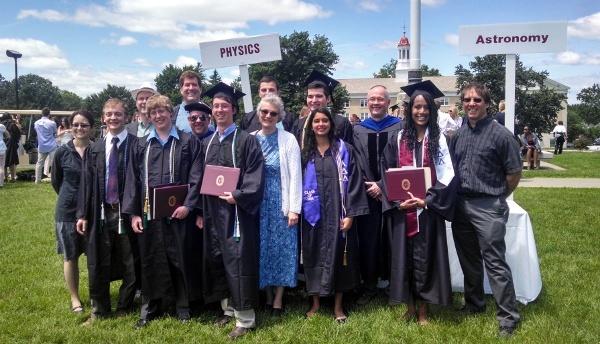 Congratulations to 2014 Physics & Astronomy graduates! Professor Vineyard, the Frank and Marie Louise Bailey Professor of Physics, presented an invited paper, “Characterization of Atmospheric Aerosols in the Adirondack Mountains Using PIXE, SEM/EDX, and Micro-Raman Spectroscopies,” at the 23rd Conference on Application of Accelerators in Research and Industry in San Antonio, TX, in May. 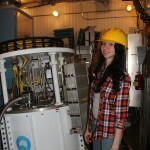 Scott LaBrake, Senior Lecturer and Accelerator Manager, and five undergraduate students were co-authors on the paper. Congratulations to Stephen DiIorio on a Goldwater Scholarship! 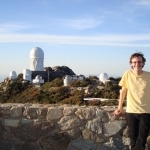 Michael Warrener ’16 and Rebecca Koopmann ’89, professor of physics and astronomy, recently observed at the WIYN 0.9m telescope at Kitt Peak National Observatory near Tucson, Ariz. The observations of the star formation properties of nearby galaxies will clarify the role of a galaxy’s environment on its evolution. Prof. Newman has published a book “Savoring Sicily” about studying biophysics on the Mediterranean island and spreading his love for the culture, history and sights to his Union students. 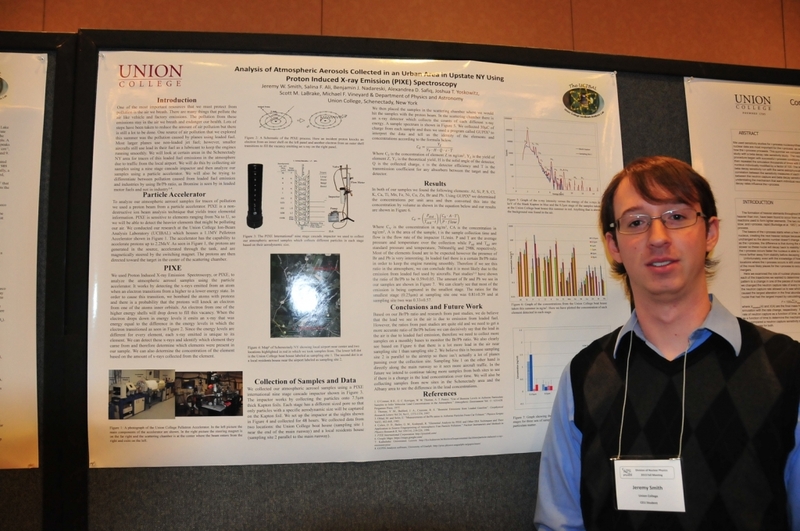 Prof. Amanuel presented three papers at the American Physical Society March 2014 meeting in Denver, Colo. “Looking for Small Changes in Heat Capacity Using Differential Scanning Calorimeter” was co-authored with physics major Will Linthicum ’14. “Phase Transition of Physically Confined 2-Decanol” was co-authored by Hillary Bauer ’12 (physics), Jargalsaikhan Dulmaa ’13 (electrical and computer engineering) Harrisonn Griffin ’16 (physics), Amer S. Khraisat ’13 (ECE) and Alexandrea Safiq ’14 (environmental studies). Amanuel and Palma Catravas, associate professor of ECE, collaborated on “IR Spectroscopy of Gasses Evolved During Roasting Coffee Beans.” This paper is co-authored by Nick Brenn ’14 (ECE), Xavier Capaldi ’16 (physics), Victoria Chee ’13 (ID biology and Asian studies/Leadership in Medicine), Alexander Clain ’15 (physics), Salman Syed ’14 (chemistry and philosophy/LIM) and Shanice Wilson ’15 (mechanical engineering). 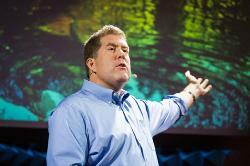 Prof. Orzel was invited to present a talk at TED@NYC, a competition to choose speakers for the main TED conference. 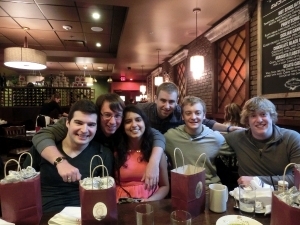 Five students from the Department of Physics and Astronomy were among 170 undergraduate students who presented posters at the 2013 Meeting of the Nuclear Physics Division of the American Physical Society (APS) in Newport News, Virginia, in October. 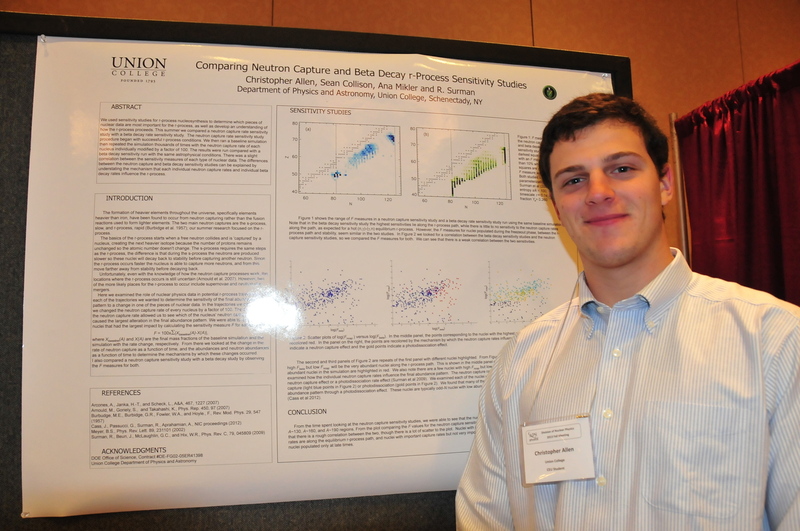 Chris Allen ’14 presented a poster on his research in nuclear astrophysics with Professor Rebecca Surman, who also presented on “The sensitivity of r-process nucleosynthesis to beta-delayed neutron emission probabilities”. 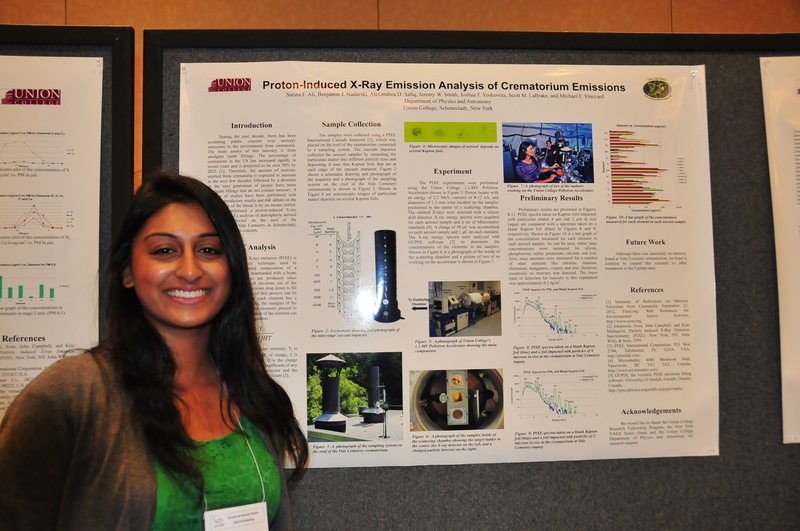 Salina Ali ’15, Alexandrea Safiq ’14, and Josh Yoskowitz ’16 reported on work they conducted with Professor Michael Vineyard on the analysis of pollutants in aerosol samples collected in the Adirondack Mountains using proton-induced X-ray emission (PIXE) and Micro-Raman spectroscopy. 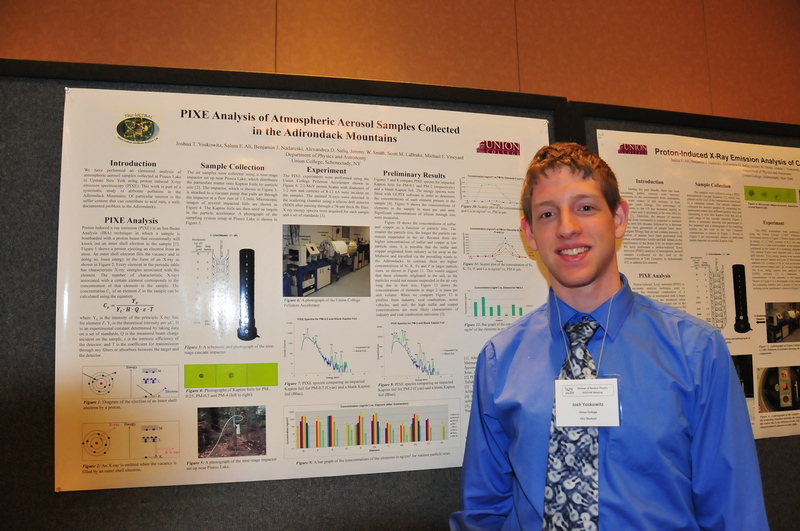 Jeremy Smith ’14 presented a poster on work he performed with Professor Scott LaBrake on the PIXE analysis of aerosol samples collected in Schenectady. The students all won competitive awards from the Conference Experience for Undergraduates program of the APS for travel and lodging. Congratulations to Lucas Viani on the award of a Goldwater scholarship! 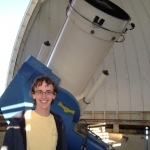 Lucas did research in the department with Prof. Koopmann on the evolution of galaxies in group environments. 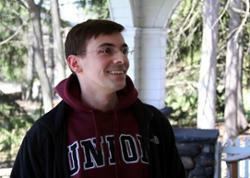 More details about Lucas’s award may be found in this Union College news article. 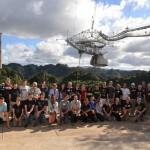 Associate Professor of Physics and Astronomy Rebecca Koopmann ’89 organized the “Undergraduate ALFALFA Team Workshop” at Arecibo Observatory in Puerto Rico Jan. 14 to 16, sponsored by a recent NSF award. 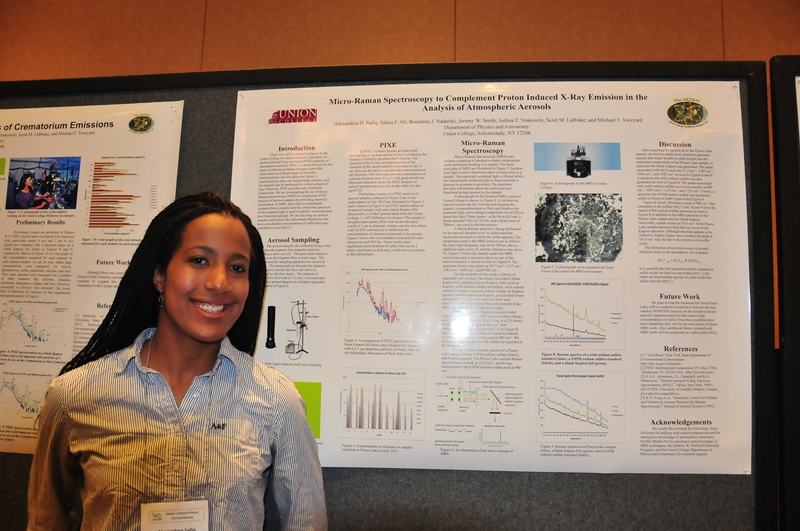 Rachel Almodovar ’15, an astronomy major, accompanied Koopmann and 17 other undergraduate students and 14 faculty members from 15 colleges and universities across the country. 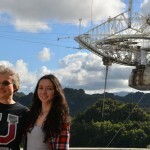 Together they learned about the ALFALFA project to study neutral hydrogen gas in nearby galaxies and carried out their own observations on the William F. Gordon telescope, the largest reflecting telescope in the world. See this Union College Chronicle story and visit The Undergraduate ALFALFA Team Workshop home page for more information.